Aging Clothes Bury Em! | How to age your clothes for Halloween! You heard me right, bury em! What a great way to age your ghastly costumes! What's even better is there is not much work involved - just time,... literally. Want to make your own costumes for your zombies, old haggard witches, nasty grannys, gruesome gramps? This is a great, easy cheap way to make costumes. All these characters have the same general costume idea, too. If you already know that you need to age some clothing for your pet zombie or some other old, ugly creature of sorts, this is a great method. 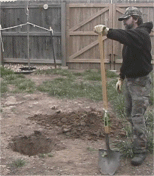 You can bury em now, dig em up later. You can get that old, dead, nasty, or rotting off clothes that appear to be from the grave itself. Now how cool is that? This clothes aging technique is best when you have months to prepare (or at least you thought of it early enough). Make a mental note of where you buried it. 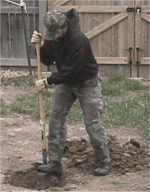 Not much fun digging holes all over the yard looking for your clothes. And you don't want to dig up anybody that you stashed before (or maybe you do and use them for a prop... hmmm). Second, get a lot of water traffic. By water traffic, I mean where the hose or water spout from your house or where water tends to accumulate in the yard after a good rain. That water will help with the "aging process". I've heard that the better choices of fabric are the natural fibers like cotton, wool, and silk. Polyester doesn't do as well. I'm going to be aging clothes bury em too. 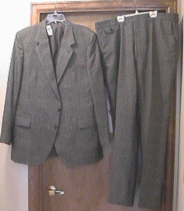 I bought this suit from ARC (similar to Salvation Army), which is a recycle shop. Cost me about $15 for the jacket and pants. Here's a picture of the suit. This suit is 100% wool. The hole was not too deep. About a shovel spade deep and about a foot wide all around. I will be digging it up around late September / early October to see just what happened to it. When I know, you'll know. Check back often.